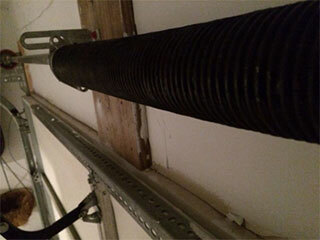 There are several variations among garage door springs. They vary greatly in the way they operate, with torsion and extension being the two main types. They also vary in their manufacturing process, as the galvanized and oil tempered variations that are available today can attest. Finding the right kind for your specific needs can be a little complex, but luckily, you can always count on our experts to provide you with all the necessary information. Clopay is the brand that manufactures the EZ-SET springs. These components are made to simplify the installation process since no particular tools other than a drill are required to get them set up. Even still, they should only be installed by professional technicians, as there is still a lot of danger involved, and a large amount of tension. The difference with these easy-to-setup components is that they have one regular winding cone at one end, as do all standard torsion garage door spring systems. On their other end, they have a cone which screws on the spring itself and snaps into the winder. This makes things much easier, as the technician then only needs to turn the screw to in order to wind tension. He does this with the drill, and can also unwind everything using a similar process. That's why removing and replacing these components is so much easier. The garage door cable drums that are used with the EZ Set is also smaller than the usual ones used for standard torsion springs. They are approximately two and a half inches instead of the standard four. One more thing that differentiates these components from their standard counterparts is that their coils are separated whereas regular coils are kind of stuck together. If you hold an EZ Set torsion spring at each end, you will be able to see that its coils move apart, whereas in regular variations they will be bunched together tighter. Even if you think you can take care of a spring related problem - EZ Set or any otherwise - by yourself, we urge you to reconsider. The sheer risks involved in replacing or even adjusting these components are far too dangerous to be worth a try. You can simply call our experts at Garage Door Repair Conroe and we'll get everything done without compromising anybody's safety.